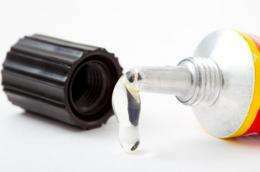 (PhysOrg.com) -- A bio-inspired superglue has been developed by Oxford University researchers that cant be matched for sticking molecules together and not letting go. It could prove to be a very useful addition to any toolbox for biotechnology or nanotechnology. You could use the glue to grab hold of proteins or stick them immovably to surfaces. You could even use it to assemble proteins and enzymes to build new structures on the nanometre scale. The Oxford biochemists came up with their new super-strength molecular glue by engineering an unusual protein from a type of bacteria that can cause life-threatening disease. While many people carry Streptococcus pyogenes in their throat without any problems, the bacteria can cause infections. Some are mild, like impetigo in infants or a sore throat, but some can kill, like toxic shock syndrome or flesh-eating disease. What attracted the biochemists interest was a specific protein which the bacteria use to bind and invade human cells. The protein is special because it naturally reacts with itself and forms a lock, says Mark. All proteins consist of amino acids linked together into long chains by strong covalent bonds. The long chains are folded and looped up into three-dimensional structures held together by weaker links and associations. The protein FbaB from S. pyogenes has a 3D structure that is stabilised by another covalent bond. This strong chemical bond forms in an instant and binds the loops of the amino acid chain together with exceptional strength. Mark and his colleagues reckoned with a bit of engineering they could split the protein around this extra covalent bond. Then, when the two parts were brought together again, they might dock and form this strong bond once more. The two parts would be locked together immovably  stapling together anything else attached to their tails.That is what the researchers have now demonstrated in this weeks PNAS. Theyve nicknamed the larger fragment which formed the bulk of the original protein SpyCatcher. Once SpyCatcher gets hold of the shorter protein segment, SpyTag, it never lets go. At least, the researchers with their collaborators at the University of Miami tried to measure the force needed to pull apart SpyTag from SpyCatcher using an atomic force microscope. But when they pulled on each end, the chemical links holding the proteins to the apparatus broke first. Boiling in detergent wont separate the protein fragments either. Our system forms rapid covalent bonds with high efficiency and high stability, says Mark. When SpyCatcher and SpyTag are brought together, they bond in minutes with high yield. It doesnt matter whether it is in acidic or neutral conditions, or whether it is 4°C or 37°C. They will stick together in test tube reactions or inside cells. And importantly, they dont stick to other things  theres no equivalent of getting your fingers stuck to the Airfix model youre building. Mark explains that there isnt really any equivalent way to bind biomolecules together. There are chemical reactions that can join two proteins together covalently but often only small proportions react, they take a long time, or they require UV light, toxic catalysts or reaction conditions that could damage living cells. The ability to attach SpyCatcher and SpyTag onto other molecules you want to glue together could have many applications. For example, sticking all the enzymes involved in a chemical process into a small factory could speed reactions and increase yields. Or you might want to bring all the elements together that plants use to turn sunlight into energy with only water as a waste product. Scientists have long wanted to come up with ways of achieving photosynthesis artificially for useable green energy. But the first uses of the molecular superglue may well be in the research lab, grabbing hold of structures within biological cells. That way you could resist the forces generated by important motors, machines and transporters inside the cell. Mark and his team are now working on developing the molecular superglue technology through Isis Innovation, the University of Oxfords technology transfer company. Sticking things to other things is one of life's great satisfactions. What with that gecko-inspired sticky pad, it's been a good week..